301 Redirect for the search usability win! This morning I read an article about CloudKick, a new Y Combinator startup that provides a nice interface for managing cloud computing resources on Amazon EC2 and Slicehost. It turned out to be a good lesson in how paying attention to basic search engine optimization (SEO) techniques can also give you usability benefits. 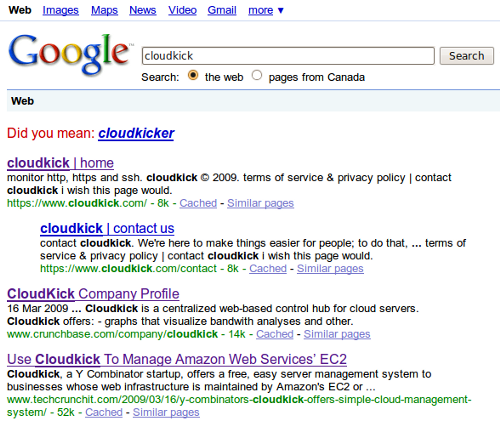 The CloudKick home page doesn’t appear until #5, and #4 is actually a separate page from their site! Not the best experience for someone searching for more information about the company. It seems odd that their official web site doesn’t appear until #4, almost as if it’s not really the official web site. And why does the contact page appear before the home page? Notice anything else? The URL on the #4 result has www in front, but the one in #5 doesn’t. I’m by no means an SEO expert, but I know a thing or two — and I could tell that because links to their site weren’t using a canonical URL, Google was treating it as two different sites. This causes two problems: first, Google doesn’t know that the contact page is actually a subpage of the main web site, and second, it dilutes the PageRank, because Google thinks that these two results represent two different sites. So I sent a quick tweet to CloudKick co-founder Alex Polvi to let him know about the problem and to suggest that they change cloudkick.com to be a 301 redirect to www.cloudkick.com (or vice versa). That lets Google know that both URLs refer to the same site. The moral of the story: you may not think you need to bother with search engine optimization, but paying attention to even the basics can give you a big usability win. Make it easier for Google to understand your site, and you make it easier for your potential users as well. Well, there's also the question whether the reason why google didn't recognize duplicity correctly is the www. prefix or the http/s protocol. I would bet on B). @Peter: Good point, maybe it was a combination of the two. 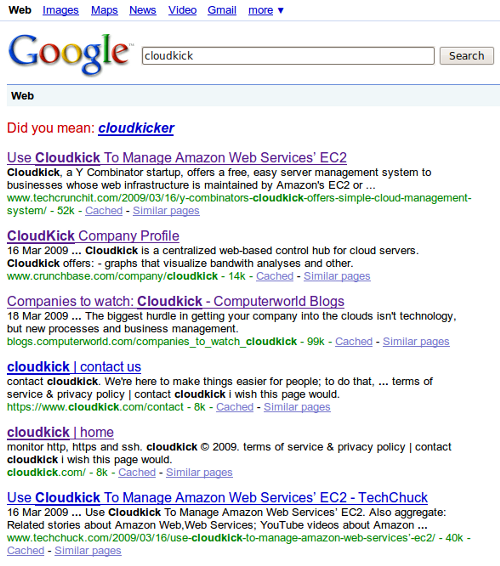 But it got fixed on Google soon after they made the change on CloudKick, so I think the key thing was the fact that www.cloudkick.com and cloudkick.com were seen as two sites. Is there anyway to get the value of a 301 redirect without ruining the site for Safari users?